I guess the bad power supplies really are quite bad. So now I have a project instead of something to do something. I guess it doesn’t matter, I don’t have a keyboard, video cable, diskettes or anything. You’ll want to configure the sound. 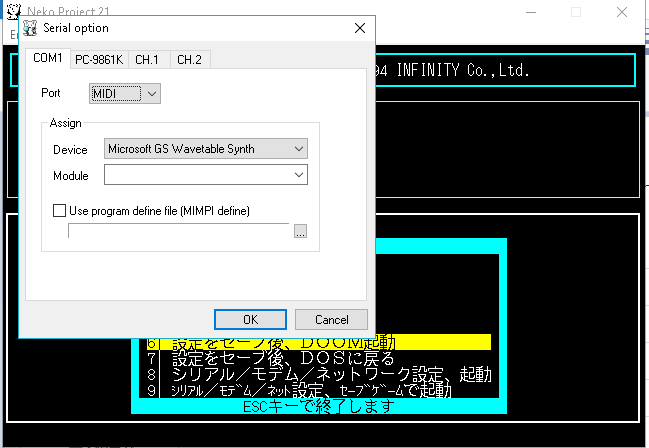 If you choose to use the MIDI you’ll have to map them to a MIDI-OUT port, and I used the default Microsoft GS Wavetable. 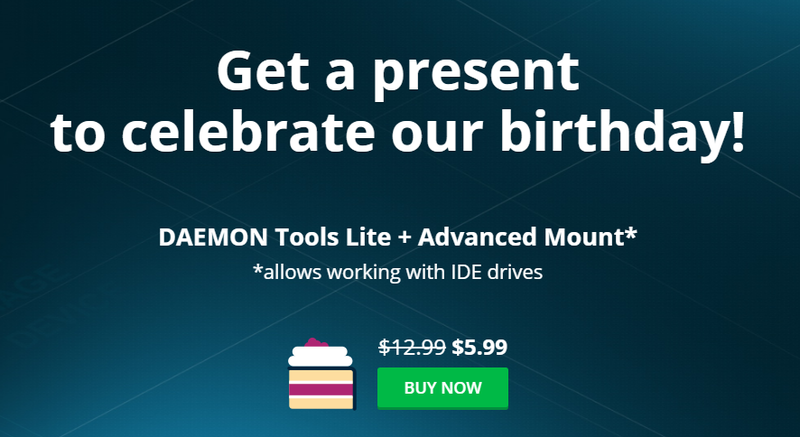 Of course you could use MUNT, or any other MIDI mapper or port. 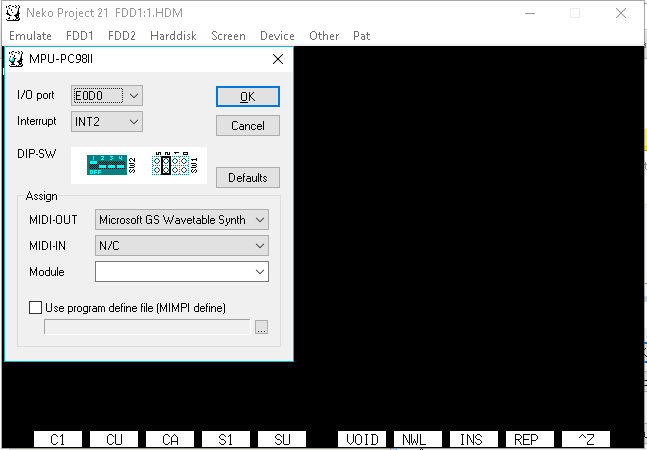 Also you may want to setup the serial port MIDI as a backup plan. 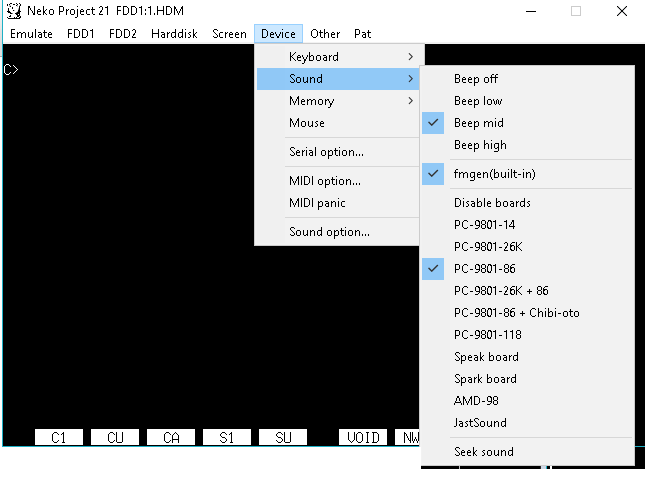 The sound effect settings work best for the PC-9801-86 audio board. 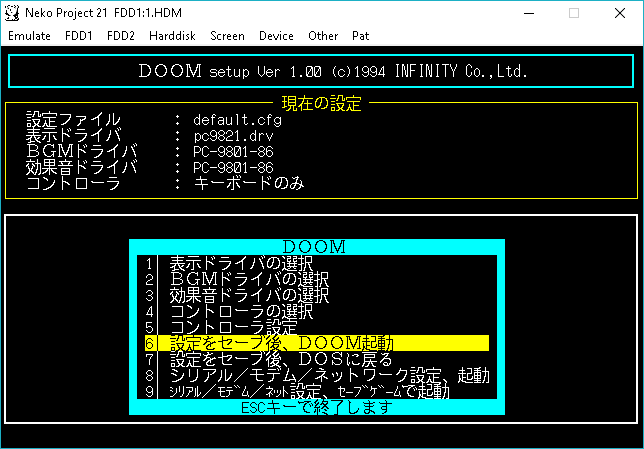 I’ll save installing MS-DOS, and installing DooM for another fun episode, but to configure DooM. 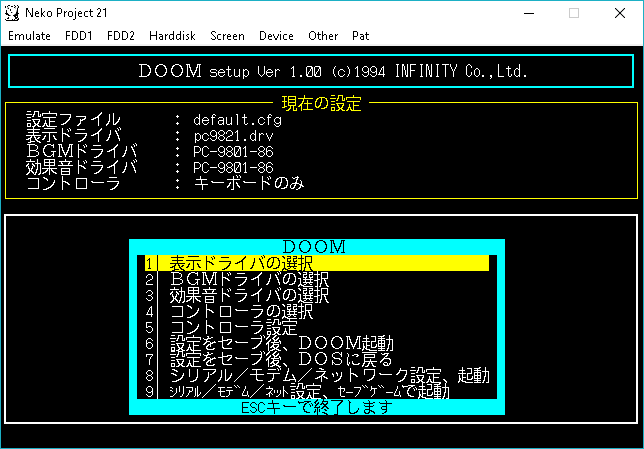 Run setup.exe to setup DooM! 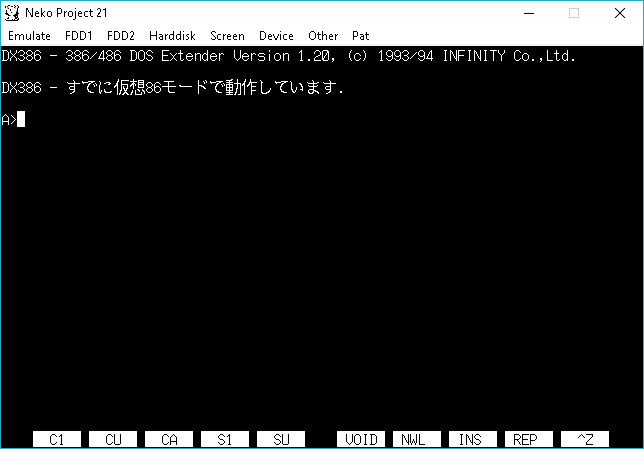 The PC9821A driver works best from what I’ve done in my limited testing. 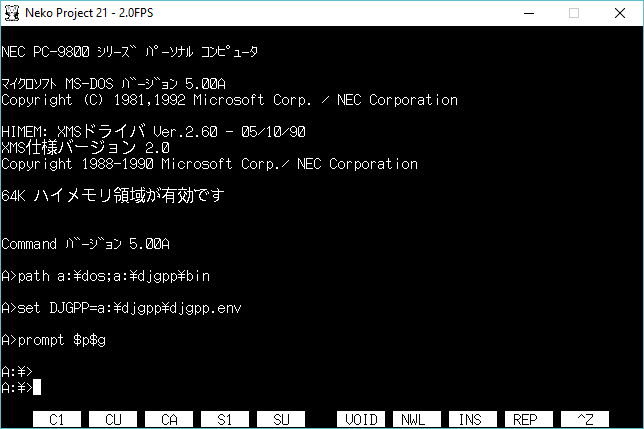 I guess if you had a different emulator, or a real PC-98 you’ll get more out of this. 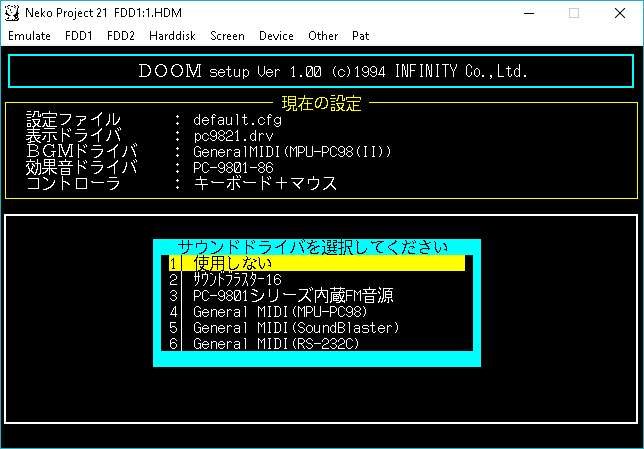 You really have 2 options here, #3 for the PC9801 driver which uses the YM2608 chip. Or the General MIDI either option 4 or 6. I didn’t notice any difference between the two of them, they both sound kinda slow, but workable. 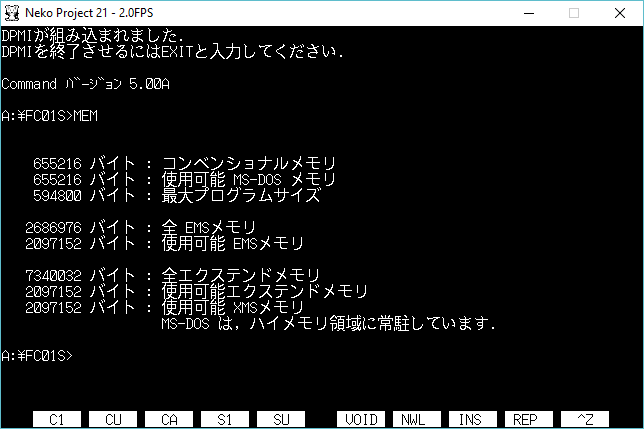 The PC-9801-86 is what you want here. 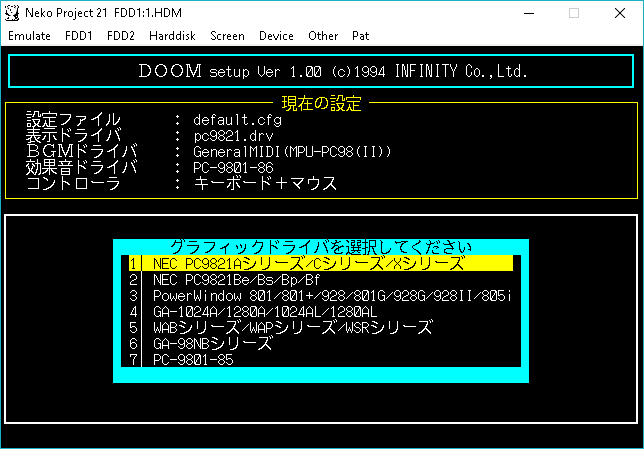 Now with either a 100% PC-9801-86 config, or a 50/50 of the MIDI/PC-9801-86 we are ready to run DooM! Selection option 6 and away we go! And all being well you’ll get the start of DooM! 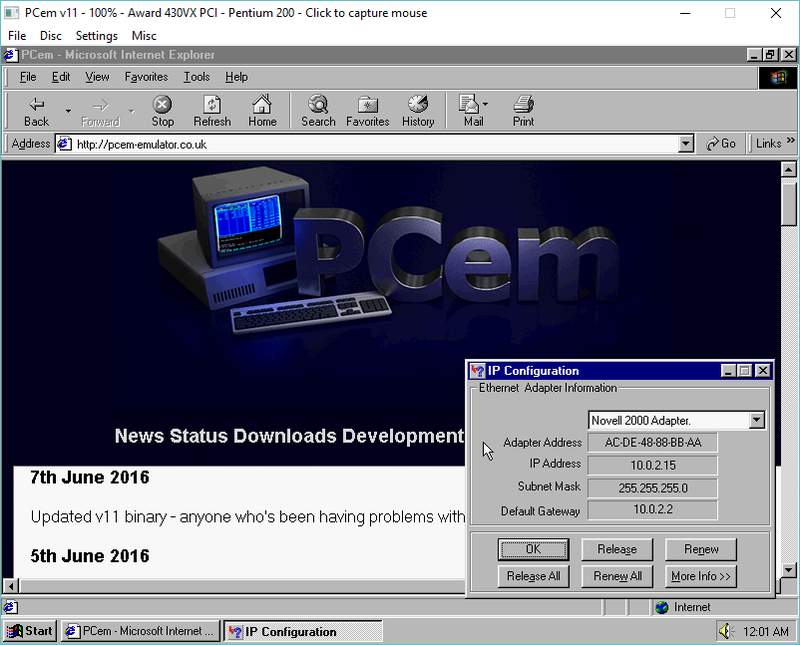 In this case I had emm386.sys in my config.sys which conflicts with the dos extender DX386. 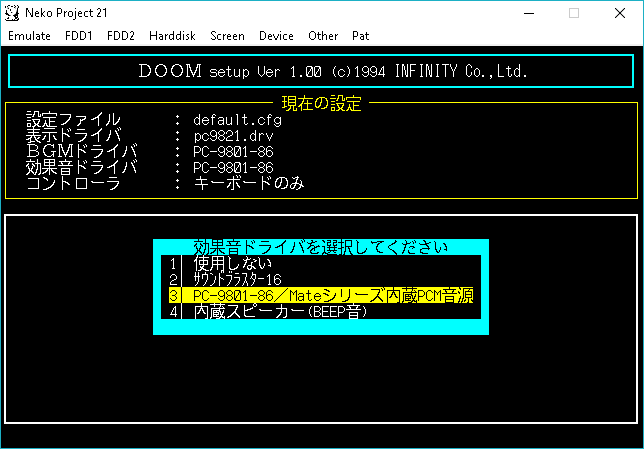 Personally I find it easier to boot off the #1 install diskette which will automatically start DooM! If you are feeling brave, listen! Anyways, I don’t work for them, I have no affiliate, no ads etc, but I think this is interesting enough to pass on. Sigh so much I wanted to do with this…. 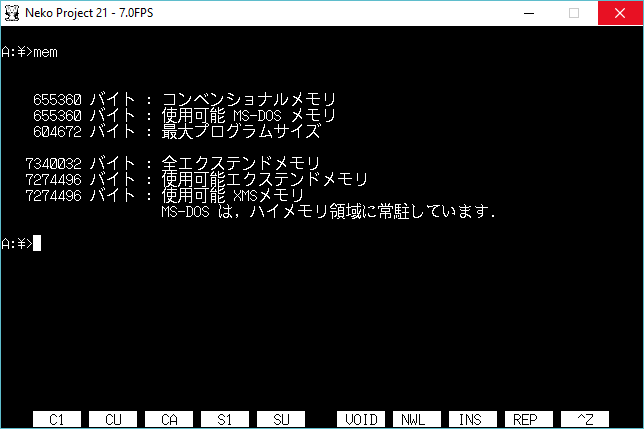 * This product includes software developed by NONAKA Kimihiro. 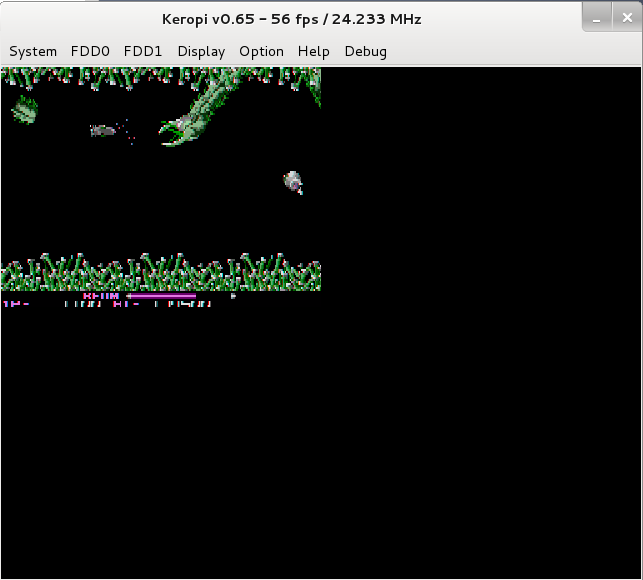 But in this case the graphics are for GTK of all things, and are hard coded to only run on 15/16bit displays.  SO by removing the requirement I got it to display something. 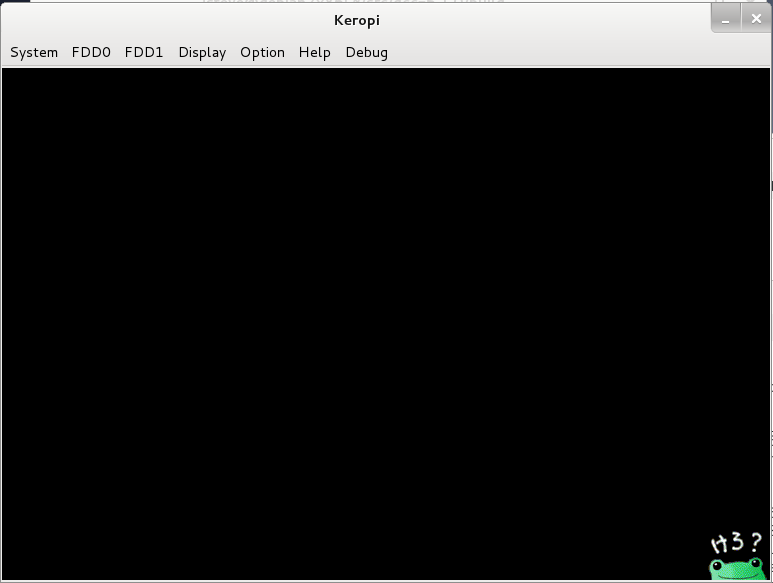 Also the IPL roms need to be in $HOME/.keropi . 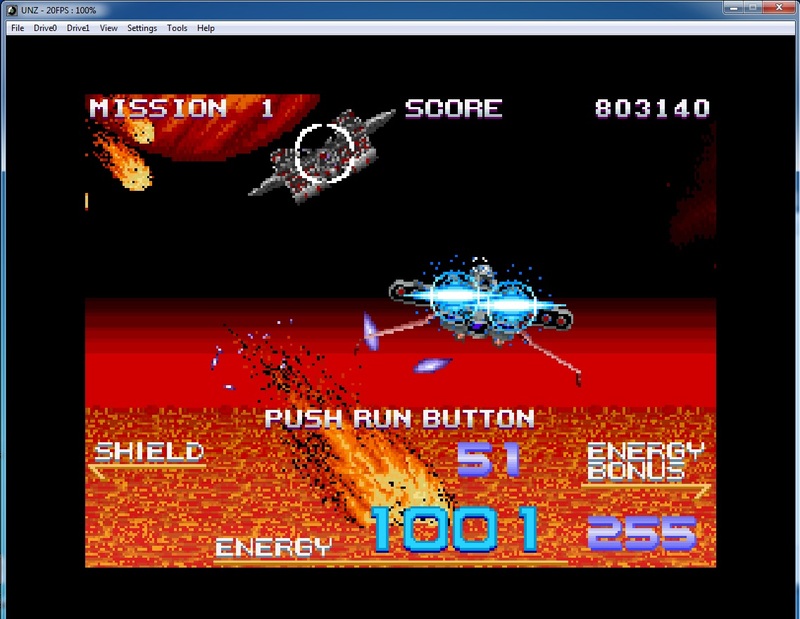 It plays R-Type well enough, but at the same time so does MAME. It’s pretty cool actually when you think that it was written in BASIC. Pretty impressive actually. It reminds me of Apollo 18.